In 2012, Vaunda Micheaux Nelson won a Coretta Scott King Author Honor award for No Crystal Stair (Carolrhoda, 2012), a young adult “documentary novel” based on the life and work of her great-uncle and Harlem bookseller, Lewis H. Michaux. 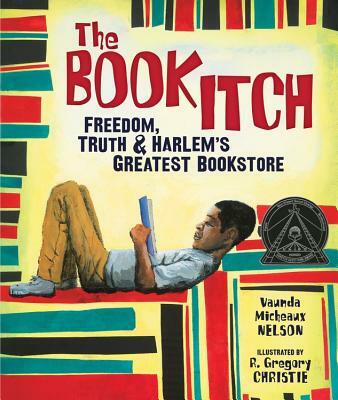 In The Book Itch: Freedom, Truth, and Harlem’s Greatest Bookstore (Carolrhoda, 2015), Nelson introduces a younger audience to the owner of the historic National Memorial African Bookstore. The story is told from the perspective of his son, Lewis Michaux, Jr., and emphasizes his father’s role as a literacy pioneer in the civil rights movement–one who established a refuge and creative think-space for other activists, scholars, and anyone interested in literature by or about people of the African diaspora. Michaux’s bookstore held over 200,000 such titles, making it the largest “black bookstore” in the country at the time. “In the 1930s, Lewis’s dad, Lewis Michaux Sr., had an itch he needed to scratch—a book itch. How to scratch it? He started a bookstore in Harlem and named it the National Memorial African Bookstore. Nelson’s three other CSK Award-winning books are: Almost to Freedom, Bad News for Outlaws, and No Crystal Stair. We are pleased to spotlight Vaunda Micheaux Nelson and her latest award-winner, The Book Itch, on day 17 of 28 Days Later. “A man with a mission leaves a memorable mark in Harlem. The National Memorial African Bookstore and its owner, Lewis Michaux, were vibrant Harlem fixtures for many years. Nelson, who told her great-uncle’s story for teen readers in the award-winning No Crystal Stair, also illustrated by Christie (2012), now turns to the voice of Michaux’s son as narrator in this version for a younger audience. The son is an enthusiastic and proud witness to history as he talks about visits to the bookstore by Muhammad Ali and Malcolm X. Michaux’s commitments to reading, knowledge, and African-American history shine brightly through the liberal use of boldface and large type for his pithy and wise sayings, as in “Knowledge is power. You need it every hour. READ A BOOK!” Christie’s richly textured and complex paintings, created with broad strokes of color, showcase full bookcases and avid readers. His use of a billboard motif to frame both scenes and text evokes a troubled but strong neighborhood. Faces in browns and grays are set against yellow and orange backgrounds and depict intense emotions in both famous and ordinary folk. The Michaux family’s deeply felt sorrow at the assassination of Malcolm X will resonate with all readers. I so appreciate the work of this author – BAD NEWS FOR OUTLAWS remains one of the most engaging and imaginative books for the nephews to put themselves into the place of the Good Guy – who looks like them and doesn’t wear a white hat. I appreciate how she mines her own life and history for stories.